While ENVI can import these data directly, you are encouraged to use the MODIS Conversion Tool Kit. Information on it’s use can be found here. 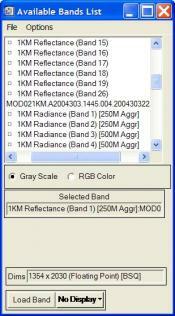 If you are working with a 1km file you should process the optical and emissive bands separately; convert the optical bands to Reflectances or convert the emissive bands to Brightness Temperatures. If you do not wish to use the MODIS Conversion Tool Kit then follow the guidelines below. When working with the MODIS daily scenes you will typically be interested in the Reflectance file and, if you have the 1km resolution dataset, the Brightness Temperature (Emissivity) file. ENVI will convert the provided digital numbers to reflectance or temperature values for you. You must then georeference the dataset to the “Geographic” projection. ENVI Standard version 5.2 and all versions of ENVI Classic can easily open and georeference MODIS daily scenes. Instructions for doing this are provided below. For ENVI Standard version 5.1 and earlier, and for images that cross the International Date Line, you should use the mctk extension module to ENVI. Check the separate YCEO FAQ for instructions on using the MODIS Conversion Tool Kit. Note that as of version 5.2.1 ENVI no longer converts emissivity values to brightness temperature. Users wishing to work with brightness temperature are encouraged to use the MODIS Conversion Tool Kit. Information on it’s use can be found here. Open a MODIS HDF file from the ENVI main menu File | Open As | EOS | MODIS. The reflectance file is loaded into the Layer Manager and all files are shown in the Data Manager. This includes files for Latitude, Longitude, and Quality. If you get the error message “IDLNARASTER::GETPROPERTY” simply click OK. Explore the scene and examine various band combinations but note that the cell values may not be converted to Reflectance until you save the file when you georeference the image. From the Toolbox select Geometric Correction | Reproject GLT with Bowtie Correction. Select the input data file you want to work with. Since the File Selection window does not distinguish the types of data, you may need to look at the layer positions in the Data Manager to see if Reflectance is the first, second, or third file in the layer stack. Click OK and the Reproject GLT with Bowtie Correction dialog window opens. You should change the Interpolation Method to Nearest Neighbor and uncheck Display result. Enter an output file name and location, click OK and wait for the process to complete. When this is done remove the original file from the Layer Manager and load the newly converted and projected MODIS daily scene! You can use all versions of ENVI Classic to open a MODIS daily scene. From the main menu select File | Open Image File and select your dataset. ENVI automatically converts digital numbers to surface reflectance, radiance, and brightness/ temperature when it opens a full “one kilometer” daily scene. You will see three separate listings in the “Available Bands List” window; identified by band name as Reflectance, Radiance, and Emissive respectively. There will also be one file named Latitude and one Longitude that you can ignore. You typically will only be interested in Reflectance and Temperature (Emissivity) datasets. There will be no data layer for brightness/temperature if using 250m or 500m files. Initially these files do not display coordinate information, but ENVI can easily generate this. From the main menu select Map | Georeference MODIS. Select a file, click on the “Spectral Subset” button if you wish to use only a few bands of data, and click OK. In the Georeference MODIS Parameters window select the desired output map projection and datum and click OK again. Finally in the Registration Parameters window select a folder and enter a new filename. Note: ENVI may select the UTM projection by default. Typically these datasets cover an area much larger than a single UTM zone so you should select the Geographic projection and click OK. You can spatially subset and reproject the image later if desired. When the georeferencing is complete ENVI places a new file with the prefix “Warp” in the Available Bands List. Double click the globe icon to display the coordinate information for this scene. You can view this in a display window and confirm the coordinate information using the Cursor Location/Value tool.